The American First Day Cover Society has elected five people to its board of directors for three-year terms beginning Jan. 1, 2012. Miller, Fisher, O'Hagan, Denis and Celli were elected to the Board. Two are new to the Board (Fisher and O’Hagan), two are returning (Celli and Denis served in the 1990s), while Miller has been on the Board continuously since 1997 and holds many other jobs in the Society. In addition, nine members received write-in votes: John V. Colasanti (10), Chris Calle (4), Norman Elrod, John Hayner, Larry Gassen, Maurice Landry, Rollin Berger, Dave Bennett, and Herbert Mendelsohn (1 each). There were 165 ballots submitted. Miller is the AFDCS Membership Chairman, Chapter Coordinator, and U.S. Postal Service Liaison. Denis is Education Chairman. Both Miller and Denis are ex officio members of the Executive Committee. Fisher is a past president of the Cachet Makers Association, an AFDCS chapter. O'Hagan is a past chair of the AFDCS' annual cachet contest. Celli is a full-time dealer. Richard A. Monty, Chris Calle, and Elrod did not seek re-election. Monty has been on the Board since its creation in 1986. He was its Chairman for most of those years. President Lloyd de Vries thanked Fred Levantrosser of Motor City Stamp and Cover Club for their work in counting the ballots in this year's election, and the Nominating Committee chaired by Susan Whitehead for recruiting the candidates. Five seats on the AFDCS Board of Directors are elected each year for three-year terms, beginning Jan. 1 of the following year. In addition to the 15 elected directors, the president, the editor of the official journal, First Days, and the general counsel serve on the board ex officio, if not elected to the board themselves. AFDCS directors are not compensated, nor reimbursed for their travel expenses. The board meets annually at AMERICOVER, the society's annual show and convention, which next year is being held Aug. 10-12 in Irvine, Calif., and via mail ballots as needed. The American First Day Cover Society, the world's biggest non-profit organization of FDC collectors, has set the dates and locations of its 2013 and 2014 show and convention. The official hotel rates for every AMERICOVER have been below $100, and that will be true for the 2013 and 2014 editions. 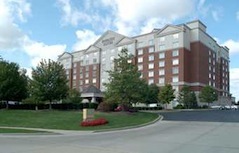 AMERICOVER 2013 will be held at the Embassy Suites Cleveland-Rockside in Independence, Ohio, August 16-18, 2013. That's the weekend after the American Philatelic Society's StampShow in Milwaukee, and on the way home for many East Coast collectors and dealers. The AFDCS also held AMERICOVER 2006 at that hotel, about 10 miles south of Cleveland and 15 miles from the Cleveland airport. AMERICOVER 2014 will be held Aug. 15-17 at the DoubleTree Somerset Hotel & Executive Meeting Center in Somerset, NJ, located within an hour of New York, Philadelphia and the Jersey Shore. AMERICOVER was last held at the DoubleTree Somerset in 1998 and 2003. StampShow that year will be held in Hartford, Conn., about 150 miles away, the following weekend. This year's AFDCS show, AMERICOVER 2012, is being held Aug. 10-12 at the Irvine Marriott in Southern California, just a week before StampShow in Northern California. All AMERICOVERs are World Series of Philately shows dedicated to first day covers and the fun of stamp collecting. All include pre-show tours on the Thursday before the show opens and a Sunday night dinner-and-entertainment event after the show closes. Locations move around the country, often at a venue within a reasonable driving distance of APS StampShow. The first AMERICOVER was held in 1992 in Columbus, Ohio. For more information on any of the AMERICOVER shows, send e-mail to showinfo@afdcs.org or write the AFDCS at PO Box 16277, Tucson, AZ 85732-6277. The 2011 Samuel and Leo August Fund cover is now available. The 2011 cover was produced in two varieties. The cover seen above features the AMERICOVER 2011 show cancel, while a second cover has the first day postmark for the Indianapolis 500 stamp issued in May. Both covers are franked with the Indy 500 stamp. These special covers were produced by ArtCraft exclusively for the American First Day Cover Society. They feature the ArtCraft cachet for the Indianapolis 500 issue, printed on #10 business envelopes of the Wyndham Indianapolis West Hotel, site of AMERICOVER 2011. Covers are $25 each. Proceeds from the sale of these covers go to the AFDCS Samuel and Leo August Fund, a special fund to promote First Day Cover collecting through public education activities. The fund is named for the brothers who founded The Washington Press, producer of ArtCraft covers since 1939. Sam and Leo were staunch supporters of the AFDCS, a tradition their firm continues today. Quantities of both covers are very limited. Click here to order. Cynthia Scott will chair AMERICOVER 2012, replacing Carl Swain, who has resigned for personal reasons. Cynthia, who chaired or co-chaired AMERICOVERs 2004 through 2008, will be assisted by our very active hosts, the Claude C. Ries Chapter of Southern California. The show will be held August 10-12 in Irvine, Calif.
You can reach Cynthia and other AMERICOVER volunteers at showinfo@afdcs.org. The American First Day Cover Society has chosen Barbara Montgomery for its 2011 Court of Honor first day cover. A stamp collector since childhood, Montgomery first began making cachets in 1993. Her designs today are hand-drawn, laser-printed and then hand-painted. She produces about 60 for the few issues she selects each year, as well as 11- by 14-inch panels with stamps and postmarks that are hand-painted with watercolors. Her cachets have won several AFDCS awards. She has also exhibited her Jamestown FDCs collection. She lives on the far east end of Long Island, N.Y. The cachet is available serviced with the 2011 Madonna and Child, Holiday Baubles, Hanukkah, Eid and Kwanzaa stamps, with a variety of postmarks, as well as unserviced. Each cover comes with a very informative stuffer card. The 2011 Court of Honor FDCs range in price from $5.00 to $8.00, depending on the postmark and number of stamps. This is the 31st Court of Honor FDC produced by the AFDCS. The entire series can be seen via this link. Covers may be purchased here. Covers may also be purchased from Foster Miller, Box 44, Annapolis Junction, MD 20701. The series honors cachet artists who have, over the years, contributed so much to the hobby through the beauty of their art. It began in 1981 and the first artist honored was Ralph Dyer. There has been a new Court of Honor FDC every year since then. 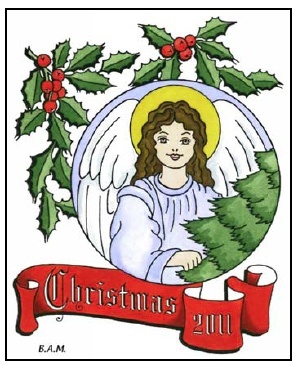 Stamps with Christmas themes are used because the U.S. issues new ones every year. A different artist is selected each year. Many of the earlier years' covers are also available; contact the Central Office for more information. AFDCS members will elect five AFDCS directors for the 2012-2014 term. Official ballots are in the September 1, 2011 issue of First Days. Candidate statements are listed in alphabetical order. Statements were limited to a maximum of 250 words. I am the owner of The Gold Mine, a stamp and coin business located on Long Island that specializes in first day covers. I started the business in 1970. I also own a pawn shop and a jewelry store. I have been a fulltime cover dealer for more than 40 years and have had a bourse table at every AFDCS convention since 1986. I served on the AFDCS Board of Directors in the early 1990s. I would like to see new ideas and new blood join the society. We need to increase the membership as well. We have to get the message out to all types of collectors that collecting stamps and covers is not dull and boring, but very educational and also very rewarding as a great hobby for young and old alike. All hobbies are getting hit hard by the economic situation in the country, as well as the competition from Facebook and video games, etc. In order to maintain our hobby we must band together and keep going to make it strong and healthy as it once was. Hopefully, I will get the chance to serve the society once again. Thank you. I’m an electrical engineer and have been a stamp collector for most of my life. I bought my first FDC in 1982. In the mid-1990s, I was editor of the Maximum Card Study Unit’s newsletter, and I wrote the “Maximum Card” column for First Days. I authored the Maximum Card Collectors Handbook in 1995, which was revised in 2009 by the AFDCS. In 2007, I published a Catalog of Norman Rockwell Paintings on Postage Stamps. I am still a frequent contributor to First Days, and have also been published in Linn’s, Stamp Collector, and other journals. My enjoyment of the hobby has always come from the friendships I have made with other collectors, writers and exhibitors, maintained through old-fashioned letter writing, e-mail, and, of course, meeting at our annual convention, Americover. I currently author the “Research Projects” column in First Days, which I conceived as a way to encourage members to correspond with other members with similar interests. I have been the chairman of the AFDCS Publications Committee for the past two years, and was recently appointed Education Director. If elected to the board of directors, my main agenda would be to continue to encourage member participation, especially communication between members. It is important for the AFDCS to find ways to make membership fun and exciting; to make the AFDCS feel more like a stamp club and not just a magazine subscription. My interest in stamps dates back to grade school when I learned world geography by collecting stamps. In 1990, I rekindled this interest by painting first day covers and developing my cachet line, called Fisher Cachets. I have served as president and vice-president of the Cachetmakers Association and four years ago revived the association’s Left-Sider News newsletter. I have been its editor and publisher since that time. For the past three years, I have been on the nominating committee of the AFDCS Board of Directors. I have received bachelor and master’s degrees in education from Indiana University and taught elementary school for a period of time. Subsequently, I was assistant director of a sheltered workshop for the retarded. This was followed by work as a rehabilitation counselor for vocational rehabilitation. For the past 37 years, I have been office manager for my husband’s private practice in forensic psychology. I look forward to attending Americover every year to renew old friendships, exchange ideas, and discuss future and long-range goals of the society. If elected, I am willing to serve in any capacity to further the mission of the AFDCS. I have been a member of the AFDCS since the late 1980s and have served continuously on the board of directors for more than 10 years. From 2006 to 2011, I served as AFDCS president and was a major advocate for the society and the hobby at stamp shows and at first day ceremonies. While president, we launched the redesigned AFDCS website, which has grown and is a leading avenue for gaining new members. Beginning this year, we also started putting our journal online. I also had the difficult task of trying to manage the society during its current financial situation, which has resulted in major delays in the publishing of our journal. The two biggest issues that I see for our future are intertwined: declining membership and financial cash flow situations. We need to seriously address both these issues and when I say “we,” I don’t mean just me or just the board, but I mean all members. I have in the past challenged every member to recruit one new member. If that had been accomplished, I wouldn’t be talking about the above two issues. I am asking for your support in reelecting me to the board of directors, but also I challenge everyone to go out and recruit one new member to join the AFDCS. I have been an AFDCS member since 1978 and life member #333 since 1997. I am currently a director of the AFDCS, chairman of the membership department, assistant treasurer, USPS liaison, chapter coordinator and AMERICOVER meetings/seminars chairman. I am a member of the Robert C. Graebner Chapter, the Claude C. Ries Chapter, the 7-1-71 Affair Chapter and the American Ceremony Program Society. I regularly represent the AFDCS at stamp shows and first day ceremonies around the country. I recently sponsored a fundraising letter for the AFDCS that raised $3,100 in its first two weeks. The number one concern for the AFDCS at present is finances. We need to return to financial stability and return to publishing First Days on its scheduled basis. The executive committee and board of directors have recently begun to take the necessary steps to make this happen and I would like to continue to be part of this effort. Once we are publishing First Days on its scheduled basis, membership recruitment and retention becomes much easier. Then we can concentrate on what is really important: keeping first day cover collecting the most fun part of stamp collecting. I started my own successful line of covers, S&T Cachets, in 1990. I have won a total of 23 best of category and honorable mention Earl Planty awards since 1993. In addition to membership in the APS, EPS, ACPS and the Cachetmakers Association, I have been a member of the AFDCS for more than 20 years and finished a three-year chairmanship of the Cachetmaker Contest in 2010. I am the proud winner of the 1994 Ward Award for an article I wrote for First Days and am a past director of the American Ceremony Program Society. My background is in budgeting, financial management and risk management. I spent my entire working career in finance-related work. I am running for the position of AFDCS Director because I want to give back to the hobby I have enjoyed for so many years. I also feel my background in budgeting and finance will help the board meet the challenges of declining membership and increasing financial problems it now faces. The board needs to look at all its costs and take the necessary steps to cut spending and control essential costs. We have to look outside the box and find new ways to do what is needed and eliminate those costs that do not produce a return to the society members. The board also needs to work on retaining membership while working on getting former members to rejoin the society. My mother, one of the first women Marines, was a stamp collector and that was how, at 12 years of age, I got involved with stamp collecting. I started purchasing ArtCraft, Artmaster and Fleetwood cachets and servicing the covers. After I graduated from High School, joined the Army, went to Vietnam, I stopped collecting. After a 30-year break, I salvaged my First Day Covers and started collecting again with a vengeance. At about this same time, I started attending stamp shows. I really enjoy Americover and have attended all but one or two in the last 10 years. Since I retired, I still have a large collection of covers, but I have devoted most of my time to buying covers at stamp shows and auctions and selling them on eBay. The buying and selling has almost become my hobby. I am proud that by promoting the society to my eBay customers, I was the number one individual recruiter for the society for two or more years. I also have a website that links to the AFDCS and the APS, as well as others. I have also shared about $600 of my eBay sales with the AFDCS through eBay’s Giving Works, a program that I suggested to the society. I am a retired supervisory auditor and sergeant first class in the West Virginia Army National Guard. The deadline for submitting first day covers for the National Postal Museum’s Owney Project has been extended. The new deadline is October 15, 2011. AFDCS President Lloyd de Vries (left) presents DSA to Ralph Achgill. This year the Distinguished Service Award Committee is pleased to honor one more outstanding member of the Society. Our honoree is a cachetmaker. 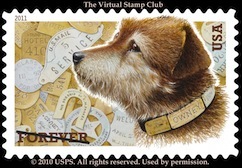 If you visit the Virtual Stamp Club site (is there anyone in the room who does not visit the Virtual Stamp Club?!) and go to “Lloyd’s Fun FDCs Gallery,” you will see a neat cover made by this cachetmaker in 1991. It celebrates the NCAA championship games in Indianapolis that year and is an event cover cancelled April 1, 1991, the date of the final game of the series. However, the cachetmaker then added the Basketball Centennial stamp a few months later, cancelled first day August 28, 1991, thus making a dual-cancelled event/FDC. Our honoree is a first day cover dealer and has been in this business over 25 years. I would venture to say that most of us have purchased from his booth or his online web site. Our honoree has been a member of the Society’s board of directors from 2002 and still serves as a director. He is former chairman of the Education Department and also served on the Executive Committee. For four years he chaired the Cachetmakers Contest. Most importantly today our honoree is the AFDCS convention dealer bourse contractor and is responsible for negotiating the many arrangements with individual dealers as well as with the convention hotel. In view of these contributions to our Society, the Distinguished Service Award is presented to Ralph K. Achgill. 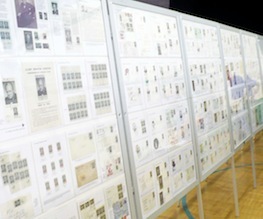 Andrew McFarlane received the Claude C. Ries Chapter Grand Award at AMERICOVER 2011 for his exhibit The 1947 Postage Stamp Centenary Commemorative. By receiving the Grand Award, McFarlane’s exhibit becomes eligible for the Champion of Champions competition at the 2012 APS Stampshow. McFarlane scored again by picking up the Reserve Grand and the Richard B. Thompson Award for First Days of the George Rogers Clark Commemorative. Best single frame exhibit and the Curtis B. Patterson Award went to James Hering for The Harding Memorial Issue, First Day Covers and the First Cachet. The AFDCS thanks the jury of Chief Judge Janet Klug, Liz Hisey, Peter Martin, Eliot Landau and Deb Nicoll. At its meeting on Thursday, August 4, the Board of Directors of the American First Day Cover Society elected Lloyd de Vries to be President of the Society. De Vries’ election became effective immediately. He succeeds Chris Lazaroff, who resigned the post earlier in the week. Upon election as President, de Vries relinquished his position as Board Chairman. The Board then elected Norman Elrod to serve as Chairman of the Board. Elrod, a life member of the Society, has been AMERICOVER chairman for several years. 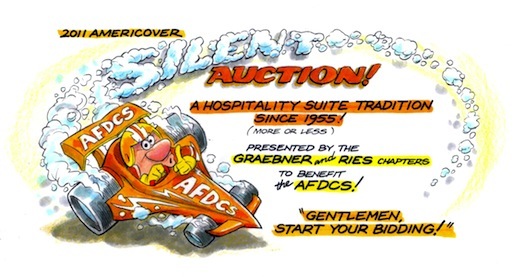 The AMERICOVER 2011 AFDCS donation auction is now set. In honor of the Society’s fifty-sixth year, AFDCS members have donated 56 lots. A complete list can be downloaded via this link. If you’re attending the show, you may view lots from 3:30 to 5:00 pm on Friday, August 5 in the Golden Ballroom 5. The Auction will begin at 5:00. 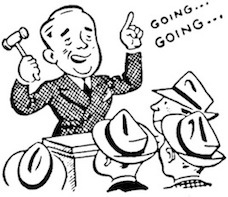 If you are unable to attend the Auction, you may place bids between 3:30 to 5:00 pm and we will bid for you. Email your bids to Foster Miller at fmillerfdc@yahoo.com BEFORE 3PM EDT FRIDAY. Chris Lazaroff has resigned as President of the American First Day Cover Society, effective immediately. In a message to AFDCS Board Chairman Lloyd de Vries, Lazaroff cited “personal commitments that do not allow me to devote the time and efforts to fulfill the duties necessary” as the reason for his resignation. Lazaroff had been President since 2006. De Vries responded by thanking Lazaroff for his service to AFDCS, and noted that Lazaroff will remain on the Board as an elected Director and on the Executive Committee as Immediate Past President. The Board of Directors will meet on Thursday, August 4 to consider naming a successor to serve the remainder of Lazaroff’s term, which runs through December 31, 2011. Indianapolis-area residents who have found stamp collections will have an opportunity to find out what they have, during an upcoming stamp collecting show. The "Stamp In Your Attic" program will be held at AMERICOVER 2011, the American First Day Cover Society's annual show and convention, August 5-7, at the Wyndham West Indianapolis Hotel (2544 Executive Drive, Indianapolis, IN 46241, near the airport). The show hours are Friday and Saturday, 10 a.m. to 5 p.m. and Sunday 10 a.m. to 3 p.m.
Bob Lamb, a well-known stamp collector, will staff the booth, where people who have inherited or found collections can bring them for a quick evaluation, and possible referral to one of the dealers at the show. There is no charge for the service, and both stamps and covers, as well as first day covers, will be evaluated. Lamb, who evaluates hundreds of collections a year, said that "most of the collections I see were put together by beginners. But at every show someone will bring in a collection which will knock your socks off." Sometimes the owners have no idea what they have. Lamb estimates that over half of the collections he sees have commercial value and often can be sold to dealers at the show. "Indianapolis is a good collecting area and I expect to see some very good material there," Lamb added. AMERICOVER 2011 also will feature two marketplaces, a national-level exhibition of first day covers, and a youth table. The 2011 AFDCS Youth Scholarship Fund first day covers are now available. The covers feature Civil War-themed cachets by Dave Curtis. Covers are available with a variety of cachets, stamps and postmarks. Covers are available for $20 each (or $25 for multi-stamp “special” combo covers), with the proceeds going to the Youth Scholarship Fund. The Youth Scholarship Fund provides a free membership for a year to a youth member or club. Covers may be ordered online by clicking here. For more information about the covers, contact Lorraine Bailey at alsaceleb@verizon.net. The tradition continues as the Robert C. Graebner Chapter and the Claude C. Ries Chapter host the hospitality Suite at this year’s AMERICOVER in Indianapolis. The suite will provide ample room for the attendees to meet and enjoy the company of fellow collectors. The suite will be open on Thursday, Friday and Saturday evenings after the other events are finished and offer light snacks and soft drinks. This year the two chapters are teaming up to hold the popular Silent Auction which is set up on Thursday and closes at 11:00 PM on Saturday evening. This auction offers a large variety of new and older material including single covers, sets on cover, ceremony programs and usually a few unique items that attract several bidders. Download a description of all the lots. The auction is open to all attendees but they must register prior to bidding so the winners can be reached if they do not pick up their lots. This auction allows bidders to obtain some very nice material and also provides the funding for the operation of the suite at no cost to the AFDCS. All proceeds above the cost are given to the show and usually provides a very nice donation. The items for the auction have been donated by Chapter members and the many members of AFDCS. This year we have 132 lots ranging from a few dollars to some covers that are valued in the one hundred dollar range. If you are not attending the convention you can have someone who is coming submit your bids. The Chapters thank all the members who have assisted in putting together the auction and who have provided outstanding material. The American First Day Cover Society will honor Barbara A. Montgomery of Hampton Bays, New York as the 31st member of the Court of Honor. Barbara’s artwork for the 2011 Court of Honor cachet is pictured to the right. Barbara’s official first cachet was for the Red Rose stamp of 1993. In the AFDCS Cachet Contest Barbara was the winner in the Hand Painted/Printed From Original Art category in 2001 and 2002 and achieved Honorable Mention in 2008. She was also the winner in both the Esoteric Covers and Miscellaneous Media categories in 2007. Unserviced envelopes will be available for purchase in late September, for those who wish to service their own covers. Serviced covers will be available shortly after the first day of issue. The theme of AMERICOVER 2011, to held August 5, 6 and 7 in Indianapolis, Indiana, is the centennial of the Indianapolis 500. To celebrate this occasion the AMERICOVER committee had artist Paul Johnson design these three pictorial cancels. Since this is the 56th American First Day Cover Society convention the number 56 is located on the racing car in each cancel. A set of three show covers is $10. The American First Day Cover Society continues to seek exhibits for AMERICOVER 2011, a World Series of Philately show to be held Aug. 5-7 in Indianapolis. Exhibitors may download the Prospectus and Entry Form. Entry Forms should be submitted as soon as possible, as the entry period may end without prior notice. For more information on AMERICOVER 2011 visit the show information page or email showinfo@afdcs.org. We continue to make every effort to get our publication schedule back on track for 2011. Thank you for your continued patience. Cachetmaker members of the American First Day Cover Society are invited to participate in a unique opportunity to have their cachets showcased in the new William H. Gross Stamp Gallery of the Smithsonian National Postal Museum. This will be the premier First Day Cover exhibit in the gallery. Individual AFDCS members and AFDCS chapters are invited to submit their cacheted cover for the Owney stamp, to be issued on July 27, 2011. All selected covers meeting the museum criteria will become a part of the permanent collection, and some will be selected for display in the Gross Stamp Gallery. Final selection of the cachets to be used in the exhibit will be done by the museum’s Council of Philatelist’s New Initiatives Committee at the committee’s fall meeting. The committee’s decisions will be final. Cachet covers entered will become the property of the National Postal Museum and may be reproduced in museum literature or displayed on its web site. Owney was a dog who found his way into the Albany, New York, post office in 1888 and was adopted by the mail clerks. Owney was fond of riding the rails with the mailbags and became the mascot of the Railway Mail Service. For more up to date information about Owney, visit the museum website and the APS Chapter Activities Committee Owney Resource Page. Cachet designs should be submitted on a standard #6 envelope using any media or technique. Downloadable images of Owney are available here. The design must be family-friendly. All submissions should respect copyright law. The deadline for registering has been extended to October 15, 2011. An application form must accompany all entries. Click here to download the application. This represents an incredible opportunity for cachetmakers to have one of their first day covers added to the museum’s permanent collection and to be considered for public display in the nation’s capital. The Owney Cachet project will promote visitation to the museum and attract new collectors to FDC collecting. The William H. Gross Gallery will be a new 12,000 square foot area at street level within the National Postal Museum. It is expected to open in 2012 and will house extraordinary philatelic treasures as well as have space for educational exhibits, temporary exhibits, and public programs. For further information about the gallery, visit the museum website. Questions regarding the competition for the Owney project can be emailed to: angelbear.hisey@gmail.com. Owney Project Team members are Liz Hizey, Mary Ann Bowman, Don Sundman, Janet Klug, Cheryl Ganz, and Katie Burke. Visitors to AMERICOVER 2011, the annual show and convention of the American First Day Cover Society, are getting a bigger bargain than originally planned. The AFDCS successfully negotiated with the Wyndham West Indianapolis to reduce the hotel room rate from $99 to $89 (plus taxes). This will be the 20th year in a row that the AFDCS has obtained a room rate under $100 — right back to the very first AMERICOVER show in 1992. This World Series of Philately show will be held August 5-7, and will feature two bourses (commercial dealers and cachetmakers), a banquet, food events, meetings, a youth table, a hospitality suite, an auction, seminars, a pre-show area tour and a post-show dinner event. A forum by a postal official involved with first day covers is also likely. 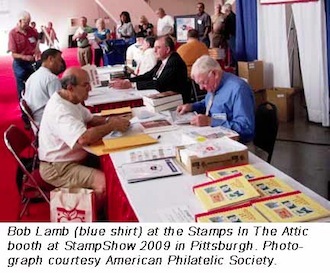 The show is being held the weekend before the American Philatelic Society's StampShow 2011 in Columbus, Ohio, which is only a three-hour drive away. The Wyndham West is also the closest full-service hotel to the Indianapolis airport — it even has departure information monitors in its lobby and a free shuttle to the airport. Its room service, business center and fitness center are all available 24 hours a day. The hotel has a full-service restaurant and sports bar, an outdoor heated pool (shaped like a goldfish cracker), free parking, and free Internet service almost anywhere in the hotel or by the pool. Guest rooms also feature 32-inch flat screen televisions and alarm clocks with mp3 capability. Several AFDCS members have noted that there are a Waffle House restaurant and two White Castles nearby, along with many other local and national-chain restaurants. To make online reservations at the special AMERICOVER rate of $89, click here. The March 1, 2011 issue of First Days is now in the mail. For those members who have online access to the magazine (Life, Gold, Silver and Online Only members), you may login and download the complete issue. Thanks again for your patience during this publication delay. Registration for AMERICOVER 2011 events is now open. AMERICOVER 2011, a World Series of Philately stamp and cover show and convention, will be held August 5-7 at the Wyndham West Indianapolis Hotel in Indianapolis, Ind. The day before the show opens, Thursday, August 4, there's an excursion to the Speedway Hall of Fame right next to the famous “brick yard” where the Indy 500 race is held every year. The bus leaves the hotel at 8:45 a.m. A $5.00 admission fee is charged by the museum. After touring the museum, get back on the bus for a ride to the home of Ralph and Diane Achgill in Lafayette. By popular acclaim, Ralph and Diane are again tempting us with some delicious barbeque, as they did in 2004. (If you would rather not eat pork, there will be other menu choices.) The bus will depart at 2:00 p.m. and return us to the hotel by 3:00 p.m. The cost for this event is $26 (not including the the $5 museum fee). After the show closes Sunday night, the 7th, you can dine and be entertained at the Beef ‘n’ Boards Dinner Theater in north Indianapolis. The featured play this time is Church Basement Ladies 2: A Second Helping. Transportation is included in the package. The price is $64. There are also food events during AMERICOVER 2011. The President's Banquet is held Friday night. The annual AFDCS cachet contest winners will be announced at the end of the evening. Banquet tickets are $52. Saturday night's food event is the post-Cachetmakers Bourse buffet, which will include soup, three kinds of salad, three kinds of deli meat plus cheeses, and all the sandwich trimmings you'd want. The cost is $25. Want to save some money? Buy the "Four Events Package" and get tickets to all the above events for $155, a savings of $12 over the single event prices. Also, all of these prices are good only through June 30--prices will increase on July 1st, so don't delay. A convenient online registration system is available here. Payment by credit card (MC, Visa, AMEX) is required. Want to pay by check? Download and print the registration form to mail with your payment. Each year the American First Day Cover Society depends on support from its members who volunteer to help at AMERICOVER. We have volunteer opportunities before and during the show. Please consider devoting just a few hours of your time to help, either before or during AMERICOVER 2011. Volunteers are not required to help all day at the show. Many of the jobs can be done in two hour shifts. To learn about how you can help AMERICOVER 2011 become a success, click here. Due to short-term financial concerns, the March 1st and April 15th issues of First Days have been delayed. The AFDCS Executive Committee and Board of Directors are addressing these concerns. An updated publication schedule will be posted when available. Thomas L. Foust, Immediate Past President of the American First Day Cover Society, passed away March 5, 2011, at the age of 80. Foust, a resident of McComb, Ohio, served as president of the AFDCS from 1988 through 2005, a total of 18 years, and continued on the Executive Committee after that until his death. He became an Honorary Life Member in 2002, and received the Distinguished Service Award in 1997 and the Glenn C. Michel Special Recognition Award in both 2001 and 2006. "He always had the best interests of the society at heart and was devoted to its success," said AFDCS executive director Douglas A. Kelsey. In addition, Foust served as president of the Fort Findlay (Ohio) Stamp and Postcard Club for more than 30 years. Besides making his own cachets, one of Foust's collecting interests was first day covers relating to Franklin Delano Roosevelt, with whom he shared a birthday. Foust was a Marine who served as a radio operator and instructor during the Korean War. He then studied fine arts at Mars Hill College in North Carolina and Georgetown College in Kentucky. He worked as a draftsman for several Ohio firms. According to his daughter Deborah, he often painted seasonal murals on the door of his two-car garage in McComb, including one depicting the school mascot when McComb High School won a championship. Foust was a member of the VFW and Elks, and a volunteer with the Hancock County Historical Society, both as an engineer on the Riverside Railroad and as a docent at the Society’s museum. He was also active in the Zion United Methodist Church. He is survived by two daughters, two sisters, five grandchildren and 14 great-grandchildren. Donations in Tom Foust's name may be made to the American First Day Cover Society (click here); Zion United Methodist Church, 9009 SR 12 West, Findlay, Ohio; or to the USS Potomac, FDR’s Floating White House. The Board of Directors of the American First Day Cover Society, the largest not-for-profit organization in the world specifically for FDC collectors, has chosen Ralph Nafziger as its Recording Secretary. At the same time, AFDCS President Chris Lazaroff has appointed Peter Martin as Editor of First Days, the society's official journal. Both positions hold seats on the Executive Committee. In addition, the Editor is ex officio a member of the Board of Directors. On the Executive Committee, Nafziger and Martin will join re-elected officers Chris Lazaroff of South Carolina, president; Michael Litvak of California, executive vice president; Todd Ronnei of Minnesota, first vice president; and Elliot Fischer of California, treasurer. In addition, the Board re-elected Lloyd de Vries of New Jersey as its chairman. This is Martin's (right) second term as editor of First Days, which he edited from 2002 to 2006. An award-winning philatelic author and editor for more than 30 years, he also has served as the editor of Scott Stamp Monthly and American Philatelist, and is also presently the editor of Duck Tracks, the journal of the National Duck Stamp Collectors Society. He is the president of the American Philatelic Society Writers Unit 30, chairman of the APS Publications Committee, and a trustee of the American Philatelic Research Library. 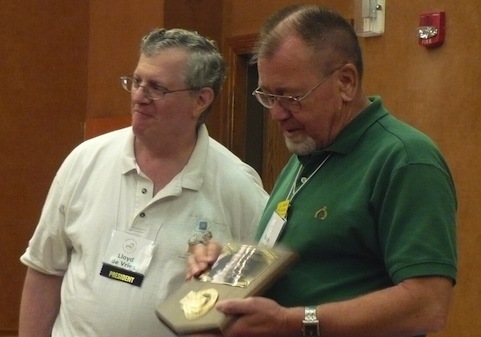 Nafziger (left), a retired research chemist/supervisor with the U.S. Bureau of Mines, won the AMERICOVER 2010 Grand Award with his exhibit "The 3-Cent Oregon Territory Issue," as well as other gold medals in World Series of Philately competitions. Recipient of a Ph.D. from Pennsylvania State University, he has 117 professional publications and presentations to his credit, as well as many professional awards. His other hobbies include astronomy, photography, hiking, snowshoeing, and playing French horn in a municipal band. AFDCS officers are not compensated, nor reimbursed for their travel expenses. The Executive Committee, which also includes the executive director (Douglas Kelsey), immediate past president (Thomas Foust), membership (Foster Miller) and education (Ralph Achgill) chairs, and the general counsel (Allen Klein), meets annually at AMERICOVER, the society's annual show and convention, which in 2011 is being held Aug. 5-7 in Indianapolis, and via mail ballots as needed. First Days, the award-winning journal of the American First Day Cover Society, is now available online for certain members. Online Members anywhere in the world can download each issue of the magazine from the AFDCS.org website, but will not receive a copy in the mail. They will pay reduced dues of just $24. Regular Members will receive a copy of the journal in the mail (no online access), for $30 a year in the U.S.
Silver Members will receive a copy of First Days in the mail and will be able to download issues. The dues for this class are $60. Gold Members have the same privileges as Silver, but get extra satisfaction for helping the Society and helping promote FDC collecting. Gold membership dues are $100 per year. Non-U.S. Members who do not choose the online membership receive a copy of the journal in the mail, at $40 a year. 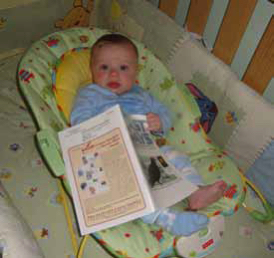 Youth members — FDC collectors younger than 18 years — are eligible for junior memberships at $20 per year. The AFDCS also offers discounts for three years' dues paid at once and Life Membership at $600. The download version of First Days is in Adobe PDF format. Each issue is searchable by keyword. To join the Society as a new member, click here. Current members wanting to renew their membership (and change their membership class, if desired), please click here. Download access is also available to Life Members and Honorary Life Members upon request. Send an email to webmaster@afdcs.org for access. The American First Day Cover Society is seeking exhibits for AMERICOVER 2011, a World Series of Philately show to be held Aug. 5-7 in Indianapolis. Now available for download is the Prospectus and Entry Form. The deadline for entering the AMERICOVER 2011 exhibition is June 1, 2011, or whenever the 160 available frames fill up. Entries are now being accepted for the American First Day Cover Society's annual cachet contest. The best FDC designs from 2010 will be chosen in 16 categories. The entry fee for adults is $5 if the cover is donated to the Society, or $10 if the cachetmaker wants the FDC returned. A complete set of rules can be found in the Jan. 15 issue of First Days, the official AFDCS journal or downloaded here. "I'm looking forward to seeing lots of entries from cachetmakers in this contest," said new contest chairman John Byrnes of Ajo, Ariz. The categories include hand-painted with no mass production of any kind; hand-colored; computer-produced; one-color; event (not first-day) covers; Rookie of the Year and two age groups for young cachetmakers. There is also the top award, which cites what the three judges feel is the best cachet submitted in the entire contest, regardless of the media used. 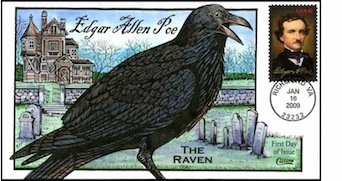 Last year’s winner, Fred Collins of New Jersey entered a first day cover for the Edgar Allan Poe stamp (above). It also won the Hand-Painted/Printed from Original Art category. 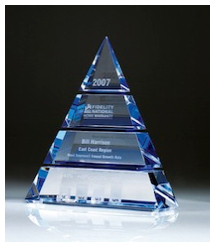 As winner of the top award, Collins may enter the contest again, but his 2010 cachets are not eligible for the top award. The results of the contest will be announced at Friday evening, August 5, at AMERICOVER 2011 in Indianapolis, and later that evening online. The American First Day Cover Society will have a booth, a regional meeting and several presentations at AmeriStamp Expo, the annual winter show of the American Philatelic Society. Throughout the three days of the show, February 11-13 at the North Charleston Convention Center, the AFDCS will have a booth, managed by Membership Chair Foster Miller. Other board members and officers will help staff the booth, and recent first day covers with cachets by the AFDCS and its Washington, D.C.-area chapter will be available for sale. A regional meeting of the AFDCS will be held Friday at 2 o'clock, followed by a DVD presentation, "Illinois First Day Covers: Cities and Towns." Members of the AFDCS are likely to be found at the show's first day ceremonies — for the Art Deco Bird coil on Friday and for the Navajo Necklace coil-of-10,000 on Saturday. Several chapters of the AFDCS also will hold meetings at AmeriStamp Expo, including the Ebony Society of Philatelic Events & Reflections, American Ceremony Program Society, and The Virtual Stamp Club. Land the big one with this two-day course! Starting with a quick review of the basics, this course will delve into intermediate and advanced level topics of exhibiting to help exhibitors who wish to win a Grand Award or beyond, or to compete at the challenging international levels. Students will explore how judging takes place in all the various exhibiting divisions. They will discover what considerations ― including treatment, succinctly conveying knowledge and research, and difficulty of acquisition ― will affect award level, and gain insight into what is in the mind of judges as they make their decisions. Drews and Wawrukiewicz, two award winning exhibitors and APS judges, will explain what separates Silver and Vermeil from Gold, and what it takes to reach the sought-after Grand Award level. Exhibitors will be encouraged to bring their exhibits for assistance and comparison with a wide range of successful exhibits in all disciplines. Register by April 6, 2011 and receive a $15 discount. Cost is $195 for APS members, $295 for nonmembers. The course meets 9:00a.m.-5:00p.m. with a break for lunch. Lunch is not included in the registration fee. The contact person is Gretchen Moody, APS Director of Education, gretchen@stamps.org, 814-933-3810.